The Washington state flag was adopted on March 5, 1923. The Washington state flag bears the image of George Washington, the first president of the United States and namesake of the state. 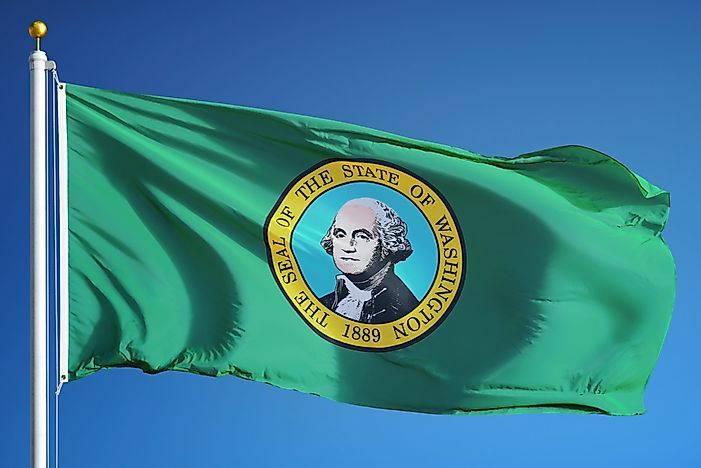 Washington state flag consists of a dark green field with the state seal at the center. The state seal bears the image of George Washington in honor of the first president of the state. Just as Washington is the only US state named after a US president, its flag is the only flag that bears the face of an honorable figure in history, George Washington. Besides, it is the only flag in the entire United States with a green background. The image of George Washington in the seal rests inside two rings on an azure blue background. The state seal border is in Spanish yellow color. The wordings ‘THE SEAL OF THE STATE OF WASHINGTON 1889’ are written in the center of the ring. The edges of the Washington state flag may or may not have a fringe. In cases where the flag is fringed, the fringe is to have the yellow or gold color as that of the seal. The portrait, lettering, and rings on the seal are in black while George Washington’s face is in eggshell. The colors of the flag are described in the Standard Color Reference of America and the Pantone Matching System. The dimensions of the Washington state flag are varied. However, the size of the seal is proportional to the length of the flag with a ratio of 1:3 between the seal diameter and the length of the flag. The year 1889 stands for the year when the state of Washington joined The Union. The green field represents the evergreen state of Washington and the verdant fields in the western parts of Washington. The gold color in the state seal symbolizes the wheat areas of Eastern Washington. The Washington state flag was adopted on March 5, 1923. Until then the state did not have an official design of a state flag. The most common designs of flags that were flown in many towns and cities in Washington were military flags with a gold profile of George Washington on a blue background. The other designs of flags flown in the state featured green and purple backgrounds with a gold state seal placed at the center. The most significant symbol of the state flag of Washington is the seal of the state. The seal was first created in 1889. Charles Talcott, an Olympian jeweler, drew the seal rings using an ink bottle and a silver dollar. He then attached a postage print with the image of George Washington at the center. The lettered wordings ‘THE SEAL OF THE STATE OF WASHINGTON 1889’ were inscribed by his brother, L. Grant Talcott. His other brother, G. Talcott, cut the printing color. The original flag was to be decorated with a green fringe on certain occasions. This feature was changed in 1925 so that the flag would be decorated using a gold fringe. The present design of the flag was revised in 1967 and on August 7, 2005, permanent rules were set by the legislature stipulating the flag specification that would reflect the textile industry standards. Most flags are made single-sided regardless of the fact that that the law requires the seal to appear on both sides.